Why do we become who we become? I puzzle over this a lot. Apparently, who we become isn’t just a matter of nature or nurture. For instance, murderers and psychopaths are both born and made. As I found out when I saw this article. Your experiences as a child change and shape your developing brain. You can start off with a brain that has the potential to become an inspiring, engaging, intelligent thought leader. Or a brutal, un-remorseful serial killer. How you turned out today could all depend on how you were treated in your early life. So … I was wondering who might we be right now, if we’d had the ‘perfect’ childhood? And what is ‘perfect’, anyway? Who can judge? Could we ever reduce our life experiences to a scaleable rating system, à la TripAdvisor? I fear failing as a mother. That every harsh word or negative comment I make could be damaging my offspring’s sweet, tender, fluffy psyche beyond repair. That my injured childhood might inflict irreversible harm to my own children. Shaping and changing the people they’ll become, all the way down the brain line. 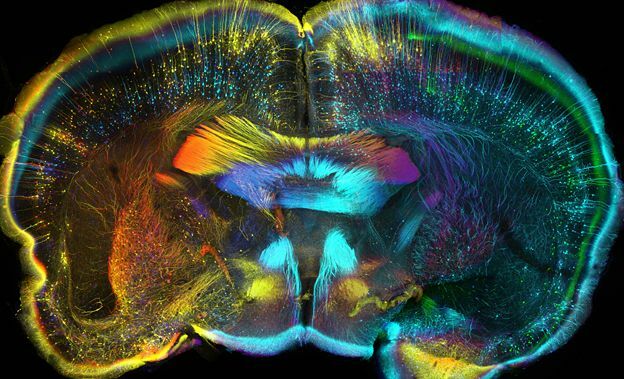 This beautiful picture of a brain is from the Wellcome Image Awards finalists 2015. See more fascinating images from the art of science here.